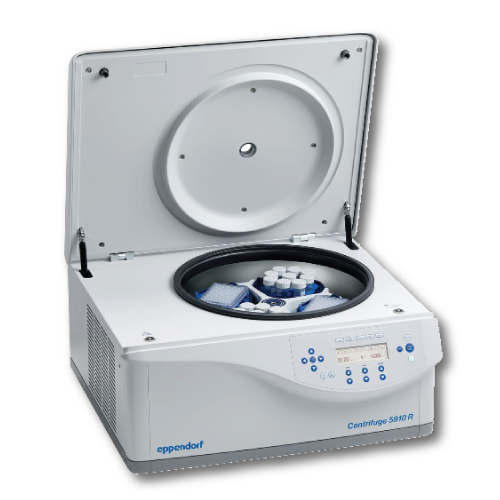 The Eppendorf refrigerated Centrifuge 5910 R is setting the next benchmark for benchtop centrifuges. Featuring a powerful state-of-the-art refrigeration system to keep your samples safe, a modern operating system for ease of use, very low noise levels for a quiet work environment, the Eppendorf Centrifuge 5910 R has the versatility to fit the needs of most research labs. Further, with a comprehensive portfolio of fixed-angle and swing-bucket rotors, this centrifuge was designed to accommodate a particularly broad spectrum of applications. Cell harvests in bottles of capacities up to 750/1000 mL, large-scale DNA and RNA isolations as well as Ficoll® gradients for the purification of lymphocytes and monocytes are merely a few examples of the many areas of application. The new universal swing-bucket rotor with unique universal adapters facilitates even quicker loading. This system allows centrifugation of conical vessels up to 36 x 50 mL, plates, and 250 mL bottles for the first time without the need to change rotors, rotor buckets, or adapters.